Women's bodies change after 45 years. 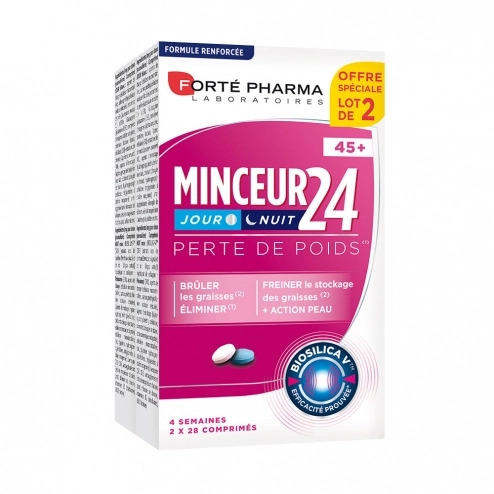 Slimming 24 FORT 45+ is specifically for women prone to this change based on chronobiology for one day and natural action and optimal night. The tablet DAY, combines Horsetail (1) which facilitates weight loss and acts on the elimination functions, Chilli (2) which helps to burn fat. The complete Zinc Action Day by participating in the normal metabolism of fatty acids. The tablet NIGHT helps regulate the assimilation of sugars using Chromium (3) which maintains a normal blood glucose. For a complete action, the tablet combines BiosilicaTM *, collagen, elastin and Vitamin B8 (4) that comes reshape the skin. In addition to the formula of CoQ10 and vitamin B2 (5), a cell protective antioxidant. (1) The Horsetail facilitates weight loss in addition to dietary measures & facilitates elimination functions. (2) Pepper helps to burn fat. (3) Chromium helps maintain normal blood sugar levels. (4) Vitamin B8 helps maintain normal skin. (5) Vitamin B2 helps protect cells against oxidative stress. Keep out of the reach of children, away from heat and moisture. To be consumed as part of a varied and balanced diet and a healthy lifestyle. It is recommended not to exceed the recommended dose. Consume preferably before the date indicated on the package. Not recommended for pregnant or nursing women and enfatns under 8 years without medical advice. 24 Fort 45+ Slimming is a food supplement that helps support the loss of weight di�tatiques measures and controlled food hygiene. Take 1 tablet white day before breakfast and 1 tablet pink night before dinner with a glass of water. Provide ideally use a month to renew.